Recently, I made an early-morning trip to some nurseries around Lalbagh with a friend to buy plants for our apartment garden. By forenoon, we had done most of our work but couldn’t resist the desire to step into yet another large nursery studded with beautiful succulents. As we went around enjoying the fragrance of those green little beauties, especially gardenias, the nursery staff got busy loading the green ‘waste’ into a BBMP vehicle. Some 4-5 workers went on feeding the truck for at least an hour. When we asked, they said it was headed to Mandur landfill. That all the garbage thrown around recklessly by 8.5 million Bangaloreans goes to Mandur is nothing to write home about. But when we did see with our eyes wide open the monster truck filled with absolutely beautiful, compostable waste, it did hurt somewhere. Think of the embedded energy spent just to transport garbage. The investment and operational cost of running and maintaining the vehicle, the labour charges for loading the waste and then transporting and offloading it. The trail of pollution left behind by the truck for at least 60 kms and then, the Mandur tragedy. More importantly, think of the pathetic waste of human energy wished away doing a worthless job that doesn’t bring a smile either on the doer and those done to death. 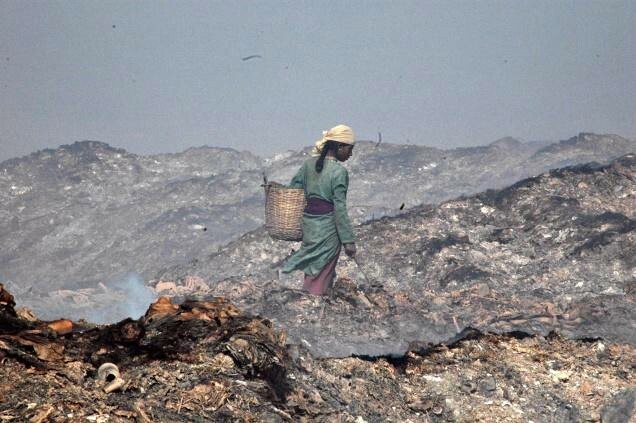 When you begin to internalise all these truths, what becomes incomprehensible is the sheer callousness of the people who refuse accept the fact that waste segregation at source is simply, perennially doable! There are not just tangible benefits here, but deeply immense self-satisfaction and awareness of the increasing self-worth just by refusing to harm the earth any further. Why do we have to wait each time for the giddy upswirl of protests and pleas from the Mandur residents to think of ‘resolving’ the crisis? Why not at least be a peripheral participant in this battle and help this tiny spot of accursed earth that is taking all the beating for no fault of its own? For related articles, please visit ‘Endlessly Green’ category. This entry was posted in Endlessly Green, Free Flowing and tagged Bruhat Bengaluru Mahanagara Palike, compostable waste, Environment, garbage explosion, Global warming, green bioresource, Mandur, Mandur landfill crisis, Sobha Althea & Azalea, waste management, Waste segregation at source, Water. Bookmark the permalink. ← Katra gangrape & murder: Open defecation is only the proscenium. Gory scenes are on the backstage. city market waste can be composted the flower market rose sticks and ferns are thrown by the vendors and we have to walk on it.Each shop should be compulsorily told to keep one bin and empty it when the sweepers come not throwing all the vegetable waste on the roads which attracts cows and this causes traffic jam.when it rains it is hell let loose.